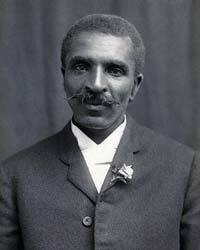 George Washington Carver was an African American inventor, educator, botanist and scientist. The actual date of his birth is unknown, but it is believed that he was born in January of 1864, in Missouri. He helped to develop several kinds of agricultural techniques that are still used throughout the world. He is most famous for his three hundred different uses for peanuts. Carver was born during the end of slavery in America. A German immigrant, Moses Carver, was his master. He bought George’s parents, Giles and Mary in 1855, for seven hundred dollars. His father died before he was born. He had ten sisters and one brother. When Carver was just one week old, he and his mother were stolen by night raiders. They were sold in Kentucky. Moses Carver hired someone to locate them, but he only found George. When slavery ended, Moses Carver, along with his wife, Susan, took care of George, as well as his only brother, James. They encouraged George to learn how to read and write. When he was thirteen, he moved to Kansas and received his high school diploma there. He then attended Simpson College in Iowa. Carver worked at a hotel to pay for his tuition and living expenses. After three years at Simpson College, he attended Iowa State. Carver managed the horticultural department’s greenhouse while he was doing his graduate work. In 1896, he earned a master’s degree in agriculture. He was now a mycology expert, as well as an expert in plant cross-fertilization. In 1896, Carver received an offer from Booker T. Washington to teach at Alabama’s Tuskegee Institute. He headed their agriculture department and he taught there for forty-seven years. He taught crop rotation methods, introduced a number of cash crops so farmers could improve their soil, launched research into various crop products, and taught many generations of African-American students about his self-sufficiency farming techniques. Carver focused on research and also experimented with innovative ways to use peanuts, soybeans, sweet potatoes, pecans, as well as other plants from 1915 until 1923. This work, and his speech at the Peanut Growers Association National Conference in 1920, caught the attention of many. In 1921, he testified before Congress about the imported peanuts tariff and this gave him more publicity. Carver was one of the most well-known African Americans during his life. He created over one hundred and forty-five products from peanuts and from pecans he developed sixty products. With sweet potatoes, he created a shoe polish, cereal coffee, paste, and another one hundred products. Carver recommended that crops of peanuts, sweet potatoes and pecans should be planted to replace the money crop of cotton. Carver published all of his discoveries in about fifty bulletins. Throughout his life, he became friends with many successful men such as Henry Ford, Thomas Edison, Luther Burbank, Harvey Firestone, Theodore Roosevelt, Calvin Coolidge and Franklin Delano Roosevelt. Carver became a member of England’s Royal Society of Arts in 1916, the oldest scientific organization in the world. In 1923, he was given the Spingarn Medal from the National Association for the Advancement of Colored People. In 1939, he received the Theodore Roosevelt Medal for his distinguished achievements in science. In 1940, Carver gave thirty-three thousand dollars to set up a foundation in his name at the Tuskegee Institute. The money was to fund research in chemistry and agriculture. In 1943, George Washington Carver died on January 5th. Carver was never married, and he left his entire estate, sixty thousand dollars to his foundation.